F/O leaving long tail to attach to head. F/O leaving long tail in order to attach to head. F/O leaving long tail to attach arms to body. F/O leaving long piece of yarn to attach to body. Stuff the boots at their widest area, making them round. Do not stuff them up to the top. Once you have filled the widest area with fiber fill, fold the end of the boots upward to form an “L” and sew them into place so that they keep their shape. Round 1: Sc in 2nd ch from hook, sc in next 5 ch; 3 sc in last ch, turn sideways and continue along other side of the foundation ch, sc in remaining loop of ea of next 5 ch, 2 sc in first ch of this rnd, sl st to first sc. Turn. Round 2: Ch 1, sc in same place as sl st, 2 sc in ea of next 2 sc, sc in ea of next 5 sc, 2 sc in ea of next 3 sc, sc in ea of next 7 sc, join with a sl st to first ch. Turn. Did I say “some”? I meant a crap load. So we will begin with attaching the snout to the head, which is going to possibly be the most difficult assembling to explain. If you’ll notice, the snout is left wide open. Place the end of the head where you fastened off, slightly into the snout, so that the snout is “cupping” the head. Now use the tail you left on the snout to sew the two pieces in place. Now you will attach the two eyes on top of the head. If you are having a hard time telling the snout and head apart, just remember that the head is smaller than the snout. Make sure the eyes are close together. I used a dot of glue from a glue gun to make sure the eyes were stuck together in the center. If your eyes seem close enough, don’t worry about it. Set the now attached head/snout/eyes aside for now. To get the boots on the legs, simply stick the open ends of the legs into the boots and use the same color of yarn as your boots to stitch the leg into place. The reason this will be the first thing you attach to the body is because it can be used as a reference for where everything else being attached to the body should go. It doesn’t really matter what side of the body you place it on because the body is the same all the way around, just make sure you position it towards the bottom of the body. 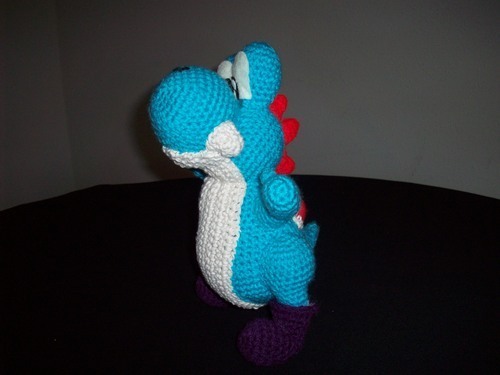 After you have finished stitching it onto the body with the tail of yarn you left after fastening off, try to shape it so that it is pointing slightly upward, just like Yoshi’s tail. This is really simple. Just place one am on each side and stitch on with the tail of yarn you left after fastening off. Simply place the head on top of the body so that the snout is slightly pointed upward. Don’t tilt it upward too much though! use the long tail of yarn you left to stitch it to the head. Here’s a link to a pic of my Yoshi! Oh my goodness!! he looks fantastic!! I’m going to post him on my website right this second. Ik ga hem maken in groen met geel. Thanks a lot for this pattern ! This was my first amigurumi and I didn’t match any particular problem. Well, as you can see on my pic (http://www.casimages.com/img.php?i=100828013123564439.jpg) he’s not a pure perfection (the pic either, by the way, but I thought you would be pleased to see the family of your Yoshi expanding all over the world !) but anyway thanks to you I made a man happy ! This could easily be modified to be a Birdo pattern, too! I’m a beginner to crochet, so I’ve never done any pattern modifying. But I’m doing crochet ami mario characters for my whole family — my sister’s fave is Birdo, so nothing else will do. You can see how similar Yoshi and Birdo are. Just need to modify the mouth, nix the saddle and front stripe, add some claws and a big red bow! I think I’m going to give it a shot! Also, you could try adding the eyelids and lashes, maybe try using the pattern for the eyelids in my Dozey the Elephant pattern. Thank you again for your wonderful pattern. Also, Thanks for posting my pattern to make Birdo, I’m so glad that you liked it. This was great. I made a change to the boots for the one I made. I was going to attach a pic but I can’t figure out how! I made one of these already, and I have requests to make more. Your pattern was so easy to follow and I loved making it! Thank you so much for sharing! My pics are available on TheArtOfCrochet by Teresa on FB if you would like to see them. I have like three people wanting me to make one for them haha. That’s so cool. by the way TheArtofCrochet rocks! Thank you so much for the pattern, I have made 2 and wrote about it on my blog, Cheers Cat. 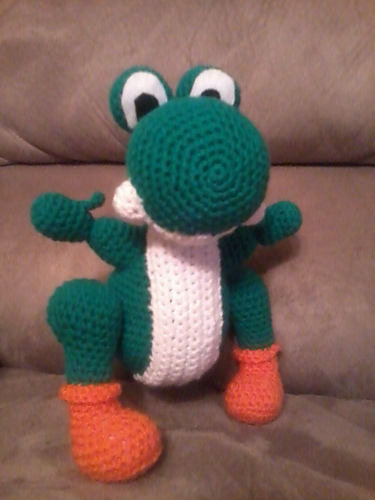 I just finished my Yoshi!! I made mine as a gift… not going to lie, part of me wants to keep him. But I know my friend’s going to LOVE it! Here’s a picture! Thanks for sharing this awesome pattern!! Yeah the eye section gets confusing, just ignore the count of 12 sts for that round. If you follow what the pattern says, it will turn out just fine. I didn’t really follow a typical format for the end of the eye pattern. I was curious if I need to join the rows? Or just continue in spiral? thank you so much for this pattern ! I’ll try to make it ! Thanks for the pattern, my son asked me to make him one and he loves it! I think it’s awesome that you put it out there for free. The instructions were easy to follow, the only thing I could have wished for would be a template for the eyes. But it’s cool cause it makes them all unique. Thanks again! Thanks for the pattern! I’m making one for a friend’s son for Christmas. So far, all I have is the head, but I’ll share a pic as soon as he is finished. Thanks for sharing your patterns for free! thanks April! let me know how it turns out! ps : totally gets why you did blue one. The brown yarn was close to IMPOSSIBLE to find in the right colour..
did you modify the boots? Thanks for the pattern! Really easy to follow, here is my effort in red http://stephnstuff.tumblr.com/post/9557792331/yoshi-he-is-finished-i-think-possibly-the although as you can see I decided to embroider the eyes on rather than use felt, although my embroidery skills still need some work. Hey Trish! Thanks for posting this AWESOME pattern. Its the only pattern I’ve seen that looks so much like Yoshi. I’ve been crocheting for a while now (since I was 10 actually, I’m 15 now :D) but this is my first amigurumi and I didn’t have a problem at all. It was really easy to follow and I’m almost done with mine. Just need to buy some felt and red thread for the spikes and the saddle. Maybe I can post pics when I’m done. Thanks again for the pattern! Hi Robotrish just to let you know I made a Yoshi to replace a toy my son lost while overseas.. and I love my Yoshi to bits! You are pure genius. I might make another one, one day. If I do I’ll make sure to take pictures as I go along. 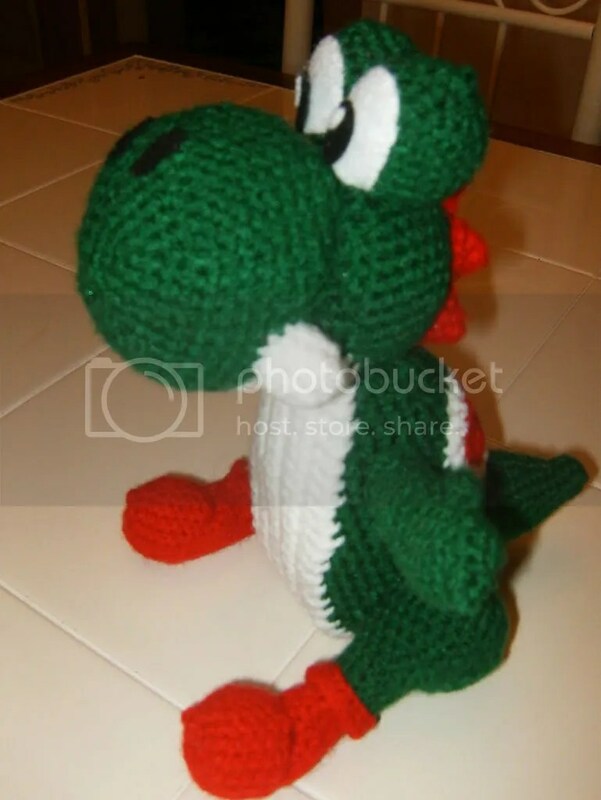 In the meantime my Yoshi is on Ravelry. Rock on! Ok, i feel dumb because no one else seemed to have any problems and i’ve been crocheting for a few years now…i’m having issues w/ the saddle. Ch 8 but sc in 5, then 3 sc in last stitch. Am i supposed to sk the st in between? Thanks so much if you can assist! hi, thanks for the pattern, I’m definitely going to try it. I clicked ont he super mario link, it gave me DNS error. Is it still active? Thank you so much, once again, for this pattern. The green version has become my son’s favorite plushie by now, he carries it around everywhere, and since the youngest is begging him to hold it all day through, I am now making another yellow one just to make them both smile. Thank you for this easy to follow and fun pattern! How tall and wide is the Yoshi? this is just what I was looking for! I just finished my Mario amigurumi and I yoshi is next! thanks!!! hugs from Argentina! 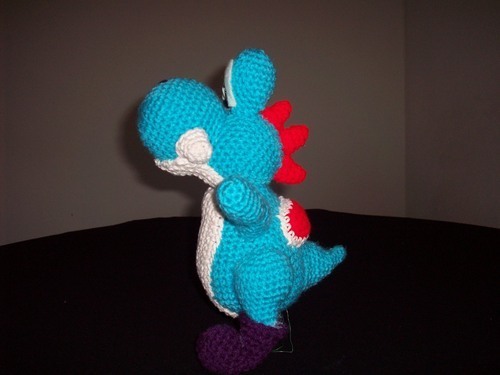 I just created a Yoshi from this pattern and gave it to my nephew for Christmas! He loved it. If you provide your email I’ll send pics. Thanks for the pattern!! I made this cute little guy for my husband for Christmas. He was very impressed! The one change I made was my position of his cheeks. Instead of putting them on his nose, I put them on his head and the little “mouth” was the only thing on his nose. (Does that even make sense?) Here are 3 pictures I took of him that might clarify a bit. Thank you so much!! i found this a few days ago and just finished! XD i messed up on the saddle a bit, however, I think it turned out nicely, i made one in red and made the spikes/saddle blue and made the boots yellow! my little brother’s an avid Yoshi fan, i know he’s going to love it! thanks once again! Finished my Yoshi yesterday, and took him on a little tour of Ottawa this morning, before gifting him to a friend. Great pattern, thank you so much! Mil gracias por el patron estoy terminando mi yoshi, es sensacional, muy bien explicado, muchas gracias de nuevo. Muchos saludos desde Texcoco, Mexico. i made a Yoshi for my hubby. I’m so happy you’re going to try your hand at amigurumi Darlene, you’re gonna love it! I look forward to see the picture!